Well, what a contrast to yesterday in a number of aspects - musically, a more powerful delivery; visually, the lighting seemed to be more atmospheric, as it played on the (smaller) stage, and on the audience; and in terms of audience atmosphere. Despite many in the crowd having been stood (either in queues prior to entry, or in their chosen position in the performance area) for a number of hours, they were clearly intent on making the most of the show and enjoying it - despite the heat in the venue for a significant chunk of the concert. During the Saucer's set, security were handing out much appreciated water to those in the front, until someone presumably put some aircon on in the venue, and things got a little more comfortable. As with a couple of other standing shows in Europe, an impromptu singalong with A Saucerful Of Secrets took place, much to the delight of the band. For this latest show on the tour, during his customary initial thanks and welcome to the audience, Nick said: "Well, as you probably know now, we are not the Australian Rogers Waters, nor indeed are we the Danish David Gilmours. 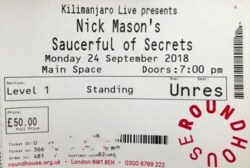 Yes, I've finally given up waiting for that phone call from Roger [Waters] or David [Gilmour]; so, we are Nick Mason's Saucerful Of Secrets! In particular, I'm thrilled to be back here in The Roundhouse. I don't know if any of you were here with me in 1966?" Responding to some affirmations from the audience, he said "No, no, you're not ALL that old! It was 52 years, and about three weeks time, the opening of International Times. Pink Floyd played on the back of a hand cart." Responding to an excited yelp from a female audience member, he clarified "Well, it wasn't THAT good. And it really launched our career at the time, so it's an important place, and it's amazing what a lick of paint, and a few light bulbs, has done. So anyway, I'm very pleased that we are now I think the oldest boyband in London, and we'll continue..."
The band now travel a few hours up the motorway to the West Midlands, and Birmingham's Symphony Hall, in the heart of the city in which Nick himself was born!